Birthplace : Pope’s Creek, Virginia, U.S.
Nicknamed "Father of His Country", George Washington was the First President of the United States. 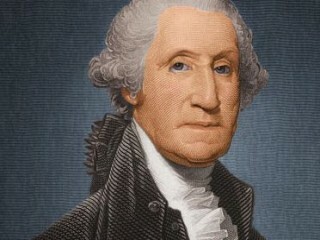 George Washington was born into a mildly prosperous Virginia farming family in 1732. After his father died when George was eleven, George's mother, Mary, a tough and driven woman, struggled to hold their home together with the help of her two sons from a previous marriage. Throughout his two terms, Washington insisted on his power to act independent of Congress in foreign conflicts, especially when war broke out between France and England in 1793 and he issued a Declaration of Neutrality on his own authority. He also acted decisively in putting down a rebellion by farmers in western Pennsylvania who protested a federal whiskey tax (the Whiskey Rebellion of 1794). After he left office, exhausted and discouraged over the rise of political factions, Washington returned to Mount Vernon, where he died almost three years later of throat infection on December 14, 1799. For months the Nation mourned him.